Hacienda Art Gallery Mumbai & Nazar Contemporary Art Gallery, Baroda both organized by Gallery Beyond (2002); Alliance Francaise, Ahmedabad (2003); Pune (2005). 'Art Journey', Gallery Art & Soul, Mumbai (2007 & '04); Indian Contemporary Art, Singapore, L.K.A. 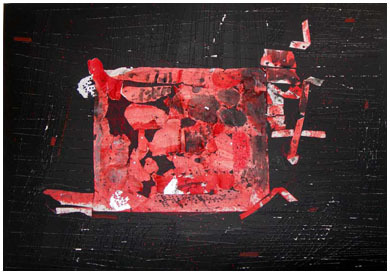 (2006); N.G.M.A., Mumbai (2005, '01 & '97); 'Abstract Vision', Muller & Plate Art Gallery, Munich, Germany (2005); 'Indian Contemporary Art in Yugosalvia', L.K.A. (2004); National Exhibitions of L.K.A. (2004, '02 & '01); 'Srujan', Son-Et- Lumiere Art Gallery (1999) & Jehangir Art Gallery (1997); '6th Bienale Art Show', Bharat Bhavan, Bhopal (1996). Important participations: 'Water & Man' Multimedia Camp, L.K.A., Chennai (2006); Camp at Istanbul, Turkey, org. by Popular Book publication, Mumbai (2005), etc. 'National Award', Lalit Kala Akadami, Govt. of India (2003 & '04); Junior Fellowship, Cultural Dept., Govt. of India (1995); Fellowship & 'Late-Shankar Palshikar Award', Sir J. J. School of Art (1989). N.G.M.A. Mumbai; L.K.A.,Chennai and several Public and private collection in India and abroad.